For the next entry in the franchise, Inafune wanted to do things a little bit differently. 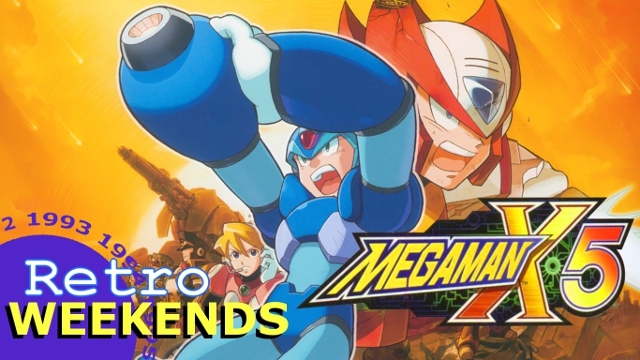 While X4 was great in making Zero available as a playable character, not much else was changed to the MMX formula. While the series was great and offered fast-paced action, to do it again a fifth time would be a bit much. And so several things were added to make the game stand out from its predecessors. First, when you power up the game and play the intro stage as X, he already has all the armor parts from X4 on him. But he can get more parts for another kind of armor. Two actually, depending on who you started the game as. Along with the Falcon Armor you can assemble, you can also assemble the spike-resistant Gaia Armor. Zero also gets armor as well (which is really a pallet swap, but has a function now). Another new feature for this game was that you can freely choose which character to play as before every stage, rather than being stuck for the whole game with one character. And finally, one of the biggest features of the game: a time limit. The story of X5 goes like this: After Sigma is defeated, he plots to take the world out with him. So he plots a scheme to get X and Zero’s attention and attacks a highway (the intro stage). He makes his fight easy on purpose so that when he’s defeated, the “Sigma Virus” is spread throughout the world. The Sigma Virus infects Reploids and turns otherwise peaceful ones into Mavericks. X and Zero realize this at headquarters. But that’s not all. The Space Colony Eurasia is on a collision course for Earth and will make impact in 16 hours. The Maverick Hunters devise a plan to destroy the colony using an old laser cannon, the Enigma, the only one that could destroy the colony. But being so old and not used for so long, they need to find parts to upgrade it. This is where the player comes in. The time limit counts down one hour after choosing a stage and entering it (there is no actual time limit for being in a stage). So you have to make your stage choice count, otherwise you would’ve wasted time. After beating a stage, you get both the weapon for X and Zero, and a part for the Enigma cannon. There are four parts in total, but the player can choose to fire the cannon without getting all parts. There’s only one shot for this cannon. If it fails, then the player has to collect shuttle parts to fly a shuttle into the colony and destroy it. But someone has to pilot it into the colony. In the end though, the probability of success and failure is almost random since one time I was able to destroy Eurasia without collecting anything.